It is halftime of the San Francisco 49ers vs. the Kansas City Chiefs. 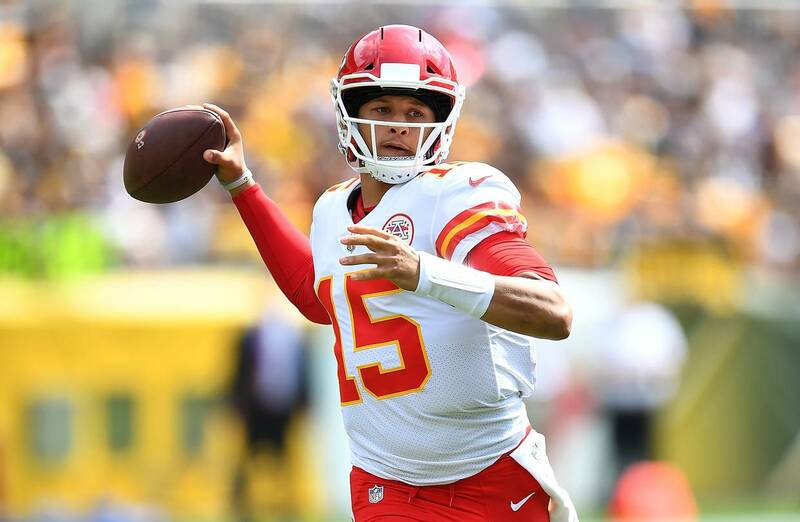 Chiefs’ QB Patrick Mahomes just broke an NFL record for most touchdown passes through Week Three with 13, surpassing Peyton Manning’s 12. Today, Mahomes currently has 252 yards passing and three TDs. Again, it’s halftime. He’s been tearing up the league, posting crazy numbers and making spectacular plays. Any reasonable person can see that Mahomes is a supreme talent with incredible potential. Surrounded by world class weapons like Tyreek Hill, Travis Kelce, Kareem Hunt, and Sammy Watkins, Mahomes’ future is incredibly bright. But just how bright is it? What is the ceiling? Is there even a ceiling? Most of the time, it’s important to not let our emotions get away from us. However, as a Kansas City native, I’m going to do just the opposite. One day, I want to be able to tell my kids about how I predicted that Patrick Mahomes II would reach legendary, George Brett-level status in KC. So, that is what I’m going to do. This story starts when I was a senior in high school. One night, my friends and I packed my basement to watch our favorite college football player, Baker Mayfield. His Oklahoma Sooners were playing the Texas Tech Red Raiders. Starting at quarterback for Texas Tech was Patrick Mahomes. At the time, I was barely familiar with who he was. Fast forward three and a half hours later, and I was in love. He ended up throwing for over 750 yards, breaking a college football record for most yards in a game. He was absurdly efficient, slinging the ball with ease. So, naturally, when the Chiefs traded up to get him in the 2017 NFL Draft, I was over the moon. Two and a half years later, Mahomes starts in his first home game in the NFL. He’s poised, not afraid of the big moment. I have to constantly remind myself that he is only 23. He’s less than three years older than I am and commanding the best offense in the NFL. A pessimist would say that he now has unrealistic expectations for the rest of his career. But I think he’s going to live up to them, and here’s why. Name any football legend, and I can guarantee that they were surrounded by a great coach, great complementary players, and a supportive atmosphere. Look at Tom Brady, who many people consider to be the ‘GOAT’. He has had the best coach in all of football, one of the best front offices, and teammates that make him better than he actually is. This equation can translate to Mahomes’ career. He has the brilliant Andy Reid as a coach, a great owner in Clark Hunt, and a large cast of incredible offensive weapons. Mahomes is so talented that the possibilities are endless in Andy Reid’s system. Reid is constantly inventing new ways to progress the ball down the field, and Mahomes is the perfect guy to lead this. NFL teams simply won’t be able to keep up with the new packages that Reid implements year-to-year. And you might be asking, why have people stopped Reid’s plans before? Because he didn’t have a guy like Mahomes. When Reid inherited Michael Vick on the Philadelphia Eagles, it was too late; Reid didn’t have the experience he has now. He now has Mahomes, a composed, confident gunslinger whose athleticism surpasses most NFL QBs. Defenses will shudder just thinking about having to face the dynamic combination of Reid and Mahomes. So, where will all this land Mahomes in Kansas City history? I think he will achieve legendary status. The Chiefs drafted him for that reason. It was the first time they drafted a QB in the first round since the early 1980s. And they traded up for him, specifically. He was KC’s guy and will be for many years. I’m not saying he’s going to change the game, but I think he’ll have his finger measured for a Super Bowl ring once or twice. Andy Reid needs a Super Bowl, and he’s going to get one. With Reid’s genius and Mahomes’ talent, Kansas City will eventually own the Lombardi Trophy once again. And when that day comes, Mahomes will be cemented in KC folklore forever, heralded as the best QB the city has ever known. The Chiefs/49ers game just ended. I now sit here off the side of my bed with a big smile on my face, writing about how great the future of Kansas City football is going to be. I smile because no one has been able to write about this in decades. Even around the turn of the century when the Chiefs had the best offensive line in football, it didn’t look this promising. That’s why I’m letting my imagination run wild. The Chiefs haven’t won a home playoff game since 1993. In fact, my dad took me to the last two Chiefs’ postseason games at home—both losses against the Steelers and Titans, respectively. At the most recent one against the Titans, I almost cried. But that era is over. Mahomes has arrived. PattyMo, PattyCakes, Post Mahomes. Pick your poison. Kansas City hasn’t had a superstar QB in decades, but that drought is finally over. Pat Mahomes is here, and he’s going to create a culture of winning—not just in the regular season, but when it counts in January and, hopefully, February. That’s what his legend will be: the playmaker who finally taught us how to finish a season. Ben Owen can be reached at bowen@wesleyan.edu or on twitter at @benjaminowen28. We get it you’re from Kansas City. Just stop.